If you’re a student or family living in a town that allows you to choose where you attend high school – or if you’re just looking for a safe, welcoming, and inspiring community in which to learn – we hope you’ll consider Choosing Us! 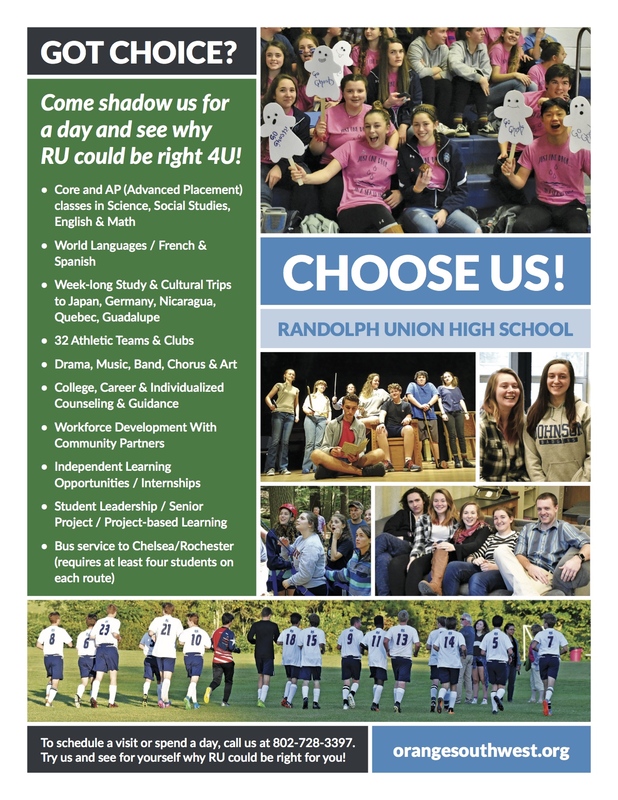 Randolph Union High School is a vibrant, challenging, diverse, and engaging school community offering a wide range of academics, athletic clubs, student clubs, opportunities for international learning and travel, and more! And we’d love to have you come shadow us for a day. Choose a day that works for you, then come on over. Sit in on an English or Project-Based Learning class. Grab a bite to eat in the cafeteria. If you play an instrument, bring it along and sit in with the band (or jazz band) and learn more about our music program. Interested in Drama and the arts? Talk with the director of our Encore Theater Program or sit in on a rehearsal. If you play a sport, let one of our coaches know you’re coming, or just stop by and meet some of the team. Interested in making a difference in the world? Spend an hour getting to know some students in our Racial Justice Alliance. There is so much for you to discover here at Randolph Union, and in so doing, you might just discover yourself! Take a few minutes and explore our web site, including The-Arts and our course catalog. Bring your questions. Bring your curiosity. Bring your trumpet if you have one...but bring yourself and find out what an exciting school and learning community we are. We’re conveniently located just outside of downtown Randolph, Vermont, 3 miles from Interstate 89 (and 4 miles from Vermont Technical College). Give Lisa or Donna a call today at 802-728-3397 to set up a school visit. You’ll be glad you did, and we’ll be glad to see you!